A pole connection ( ) is a useful form of solid connection resulting in a semi-freestanding straight line of three, or possibly more, stones. The pole connection ( ) would usually occur in practice in response to a move such as the hane of . It exerts more influence toward the top than alternatives such as the extension of a. Correct shape for Black here is the pole connection of . In this 1-space low pincer joseki, is a pole connection. 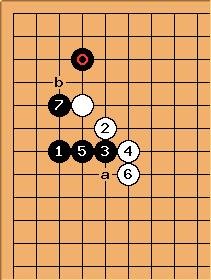 The natural move for most players would be at a, and this too is a joseki, emphasizing the left side. 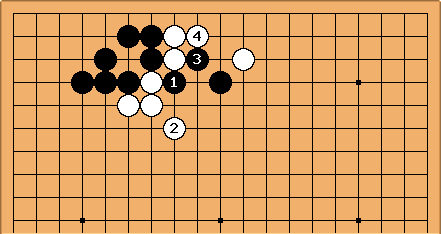 The pole connection has the advantage of allowing the link-up at , however, forcing white to choose between reducing Black's influence at or separating at b. 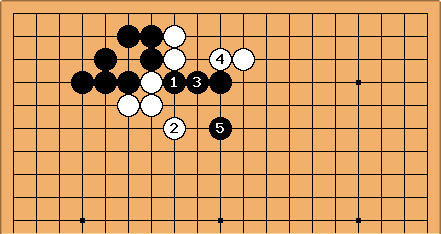 If White chooses b, Black will hane at and treat his marked stone lightly, trading the corner territory for a wall facing the left side. In Japanese usage, Bo-tsugi is distinct from pintsugi in that the latter is an alternative to katatsugi and means any solid connection, not just one in a straight line.